It’s almost the end of the year, so we thought we’d take a moment to reflect on some of the articles we’ve posted throughout the year about Microsoft products. 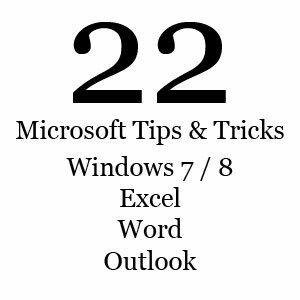 Whether it involves Outlook, Windows 7 or 8, Word, Excel, One Note, or other Microsoft related products, we’ve probably written an article about it, packed full of tips, tricks, or other helpful information. If you missed these posts throughout the year, now is a great time to catch up, and possibly learn something new, and maybe even carry those new skills into the New Year. If you are having a problem with your computer, Windows 7 has many built into tools to help troubleshoot the issue. This article explores those tools, helping you understand not only what diagnostic to run, but also why you should run it. Bitlocker is a valuable built in encryption software available in newer versions of Windows (Vista and above), and available on Server 2008 and above. Read this article to learn more about how and why this built in software protects your data from offline hackers. This article is full of tips and tricks about pinning items in Windows7, so that you can access your most frequently used items faster. If you’ve decided to upgrade to Windows 7, but you don’t understand the options, then check out this article, which explores the differences between the versions. The second half of the article exploring Windows 7 version options. If you’ve read part one, part II finalizes the discussion, so check it out. Who knew the Windows7 calculator was so robust? This article explores the many features of the new calculator. This article contains lots of great shortcuts to help you use Windows7 better. Looking to discover how Windows 8 is different from previous versions? Then check this article out. Want to understand the difference between the Windows 8 versions before you buy? Then read this article, and save yourself from getting a version that isn’t compatible with your needs. Are you still using an older version of Microsoft Office? If you’re considering upgrading, check out this list of reasons why you should. There are many great tips packed into this article. If you spend a lot of time in Excel, you should read this article chocked full of tips and tricks to help make you a better Excel user. PivotTables are an easy but powerful way to arrange, organize, and display your data. Read this article to learn about PivotTables and how to set them up. If you have been looking for a solution that allows you to keep your notes in one place, across multiple platforms (desktop, laptop, mobile device), consider using Microsoft One Note. This article explores why this is a MUST USE piece of software in the Microsoft Office suite. Oops, did you accidentally send something you didn’t mean to send? Now you can recall the message, if you’re using Outlook 2010 or newer. Use Outlook’ AutoArchive features to keep large mailboxes running smoothly and efficiently. Read this article to learn how to update your settings and activate this feature. Tired of clicking on an email in Outlook, and then waiting a while for it to be marked as read? There’s an easy way to change the time it takes for Outlook to mark the item as read. Read this article to find out how. Quickly locate commonly searched for items in Outlook by setting up search folders. Read this article to find out how to setup and use this feature. Don’t waste time saving emails the hard way. Instead, read this article and learn to quickly save emails with ease, saving you loads of time in the long run. Learn about the Quick Access tool bar in Outlook, and how it can help you make the most out of your email software. Quickly accomplish multiple step tasks, like organizing emails into specific folders, with Quick Steps. This article explores what they are, and how to quickly and easily set them up. Each time you hit tab in a Word document, you could be messing up your formatting. This article explores how to use tab stops to properly format a document without having to space items manually (which can skew the spacing). Need help adjusting the space between the lines of text in your Word document? Want to discover where that extra return is coming from? Read this article to discover ways to fix hidden formatting issues in your Word documents. Julie Strier is a freelance writer who likes to help you use your software more efficiently. Email:julie@mybusinesswriter.com. Website: www.mybusinesswriter.com. ©2012 TechQuility, LLC. All rights reserved.